The food industry expects increasingly complex properties (such as delayed release, stability, thermal protection, and suitable sensorial profile) from food ingredients, which often would not be able to be achieved without microencapsulation. This paper presents the state of the art in encapsulation technology for delivery of bioactive compounds to food. It reviews common encapsulation technologies (emphasizing their advantages and limitations) versus novel, interesting approaches in emerging technologies. 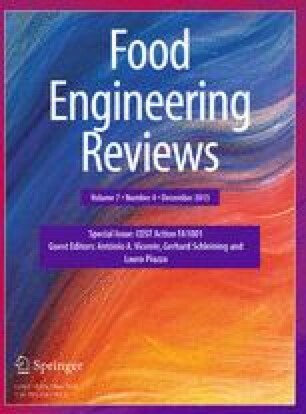 This review includes a presentation of benefits resulting from the use of microencapsulated ingredients in the food industry; these benefits are going to be illustrated via few case studies bringing innovative processing. Spray drying has been used for more than 60 years to protect flavor oils against degradation/oxidation/evaporation, but melt dispersion technique has been used lately to effectively stabilize an aroma compound. Microgels produced by extrusion and emulsification techniques are considered for delivering synergistic antioxidant effects of plant extract polyphenols, their off-taste masking, and improved handling. Apart from microgels, microemulsions (produced by microfluidization or micelle formation techniques) are taken into account for entrapment of extracts containing polyphenols and essential oils. Innovative and interesting coacervation processes are depicted here as they facilitate the commercialization of coacervated food ingredients. Liposomes are gaining increasing attention in the food sector as they can provide good stability even in a water surrounding and also targeted delivery. The new scalable manufacturing protocols for the production of liposomes evolved in recent years (e.g., proliposome method) are presented here. Fluidized bed technology has been offering a versatile possibility to produce encapsulates which should release ingredients at the right place and the right time. Complex systems such as lipids in hydrogels are newly developed structures for controlled release of bioactive compounds. Finally, the effect encapsulates have when incorporated into real food products will be discussed, in particular with regard to the production of innovative functional food products. As an example, textural, sensorial, and physical quality assessment of chocolates enriched with encapsulated polyphenolic antioxidants from yarrow (Achillea millefolium L.) will be reviewed. This work was supported by the COST action FA1001 “The application of innovative fundamental food structure–property relationships to the design of foods for health, wellness, and pleasure,” as well as Ministry of Education, Science and Technological Development, Republic of Serbia (Project No. III46010) and the Ministry of Science, Education and Sports, Republic of Croatia (Project No. 058 3470).